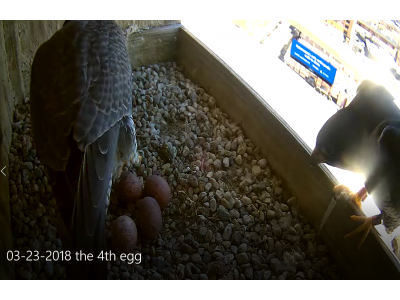 The fourth egg arrived today. Kudos to Sarah M for spotting it during a quick change of the guard about 1:30 PM. It continues to be windy and cold in Kalamazoo and the adults have kept the eggs covered almost nonstop. Seeing the eggs for a few seconds as the birds change position is like finding a needle in a haystack. The timing is just luck.